A talented group of global journalists, including the first graduates from Nepal, Jamaica and Ukraine. I am so excited about the opportunities I have had in China to work with journalism students — both international and Chinese — and professional journalists to improve the caliber of reporting and writing in China, and to prepare us all for the Brave New World of journalism in the Digital Age. Here is a transcript of my speech at the July 10 commencement of the Tsinghua School of Journalism and Communication Global Business Journalism Program. 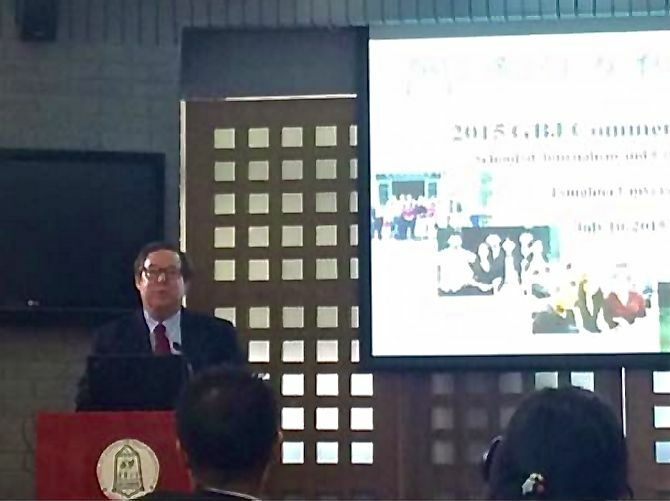 Speaking to the 2015 graduating class of the Global Business Journalism Program at Tsinghua University. I am honored, on behalf of the faculty of the Global Business Journalism Program, to congratulate you on your successful completion of graduate studies at the Tsinghua School of Journalism and Communication graduation. It indeed has been an adventure – a voyage of discovery – for all of us. You represent the best of China and the best of the world. Over the past eight years, students from more than 50 countries have studied together, worked together, gotten to know each other here in the Global Business Journalism Program at Tsinghua University. Ours is a vibrant tapestry of cultures and ideas. You have been exposed to new perspectives, whether they are from the minds of brilliant Chinese professors or veteran international journalists who have plied their trade at the highest levels in the United States and around the world. All of us have gained a better understanding of the rapidly changing world we are inheriting, the rise of China and the rapid transformation of its economy, the complicated dynamics of our interdependent global business world, the rapid transformation of our own world of journalism and the imperative to learn new multimedia and data skills to compete in the emerging journalism marketplace. You have been tested with rigor. You have passed the test. I am so proud of you. Eight years ago, the Global Business Journalism Master’s Degree Program was just a dream, an idea conceived by some exceptionally creative souls at Tsinghua University in Beijing and at the International Center for Journalists in Washington. In just a few years, it has gained tremendous respect throughout China and around the world, attracting renowned international scholars and Pulitzer Prize winning journalists to work with our students and share their wisdom and their skills. From the beginning, the GBJ program has been nurtured by the invaluable and incalculable support of Bloomberg News, with its unprecedented gift of ten of its priceless terminals, a series of guest lecturers and events, and a wonderful faculty member named Lee Miller. 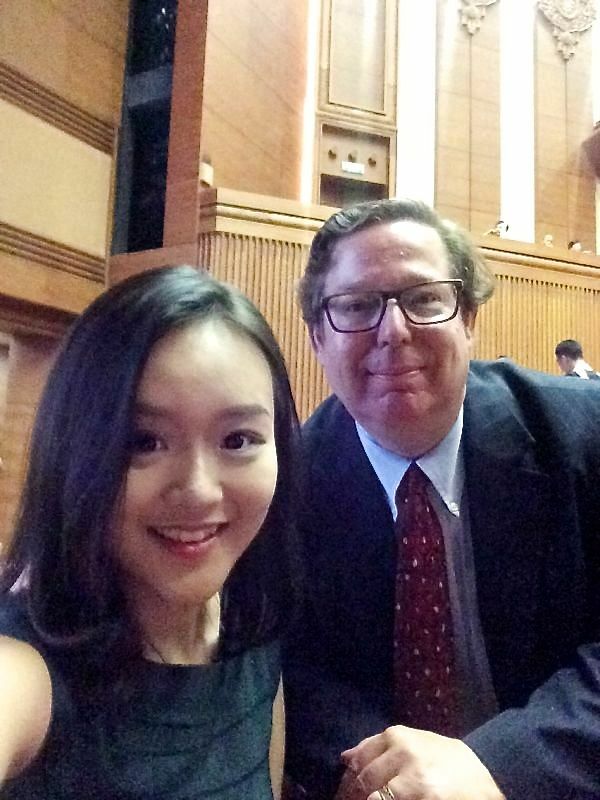 One of Tsinghua’s finest, Zhang Sihan, is heading to Columbia University to pursue a dual master’s program in journalism and public policy. And special thanks to my partner in the program, Dr. Hang Min, for her support, her wisdom and her guidance in making the GBJ program an invaluable resource for global journalism. Under her leadership, we have offered some of the most advanced classes in communication theory, as well as practical, advanced skills that will help our graduates succeed in their chosen field of endeavor, whether that be global business journalism, business, journalism, or something else somewhere on this globe. By setting exacting standards and requiring rigorous coursework, the GBJ Program has helped to improve business journalism in China by training a new generation of highly qualified journalists specializing in economics and business. Our Chinese graduates now work at some of the most important media outlets in China, such as China Daily, Xinhua News Service, CCTV, and Radio Beijing, as well as at important international media outlets such as Bloomberg News. That is a testament to the quality of our alumni. It also is a testament to the iron will of friends in the Tsinghua School of Journalism and Communication who have exhibited an unwavering commitment to our success and our continuing growth. Dr. Shi Anbin has been a champion of our cause and a special mentor to me as a newly minted college professor. Thanks, Dean Shi, for everything you have done to make GBJ what it is today, and thanks to Dr. Jin Jianbin and other school officials for their support. Of course, as all of us know in business journalism, you can’t have an entrepreneurial venture without some venture capital. I would like to thank our founding sponsor, Bank of America, for its steadfast commitment to the program since 2007. I would like to close by quoting from my favorite philosopher, who happens to be my grandfather, Barrows Dunham. Despite a turbulent professional career that included an unwelcome appearance before the U.S. House Un-American Activities Committee and a spot on the American blacklist during the Red Scare Era of the 1950s, my grandfather, a distinguished philosophy professor and internationally acclaimed author, never lost his sense of patriotism or optimism. None of us know what the future will hold. But with the knowledge we have gained at Tsinghua, the support of our families – and, yes, the Global Business Journalism family – we can conceive that better future. 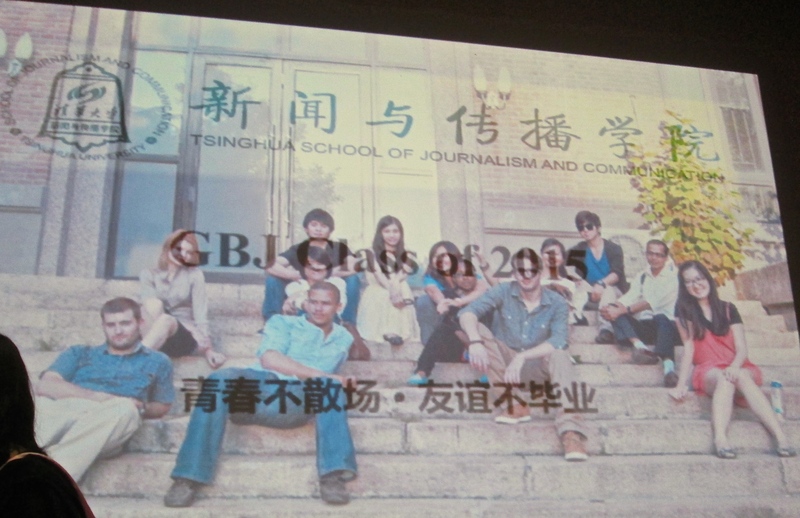 Congratulations to the Tsinghua Global Business Journalism graduating class. Good luck to all of you. Thank you.